Because as detailed before, Andy Jaenen, Skylimit boss, had pulled in a favour from the Spa-winning Marc VDS driver, Markus Palttala. So the Finn was deployed on to a sodden track. And provisional pole position was taken by a clear two seconds. In Q2 a couple of cars edged closer to Markus’s time, but not close enough to warrant risking the car again. So I just wobbled around and bedded in some new pads. The pits are an interesting place to be, and the ladder below is how we get from our paddock UP to our pits! UPDATE: It’s the morning after the night before. Wow. The rain kept coming, right until the very end. After Markus’s rocket-ship qualifying lap, it was our turn to jump in the car. Davy, then Robin, Simon and finally me. But when Robin brought the car back, it was overheating and something was amiss. What followed was an hour of Simon sitting in the car, with the occasional check lap, before the culprit (a faulty waterpump, which is 100% electrical in the E90!) could finally be swapped. The boys managed to complete this three-hour task in a little over 30 minutes! So after Simon completed his mandatory minimum night-time laps, it was my turn. My task was simple: complete three laps in order to get start permission for Saturday’s race. Don’t crash. Don’t blow up the car. Don’t break anything. But learning a new circuit, at night, in the wet… just “wow”. I’m as happy as a pig in poo at the Nürburgring, but that’s probably because I do thousands of laps each year. 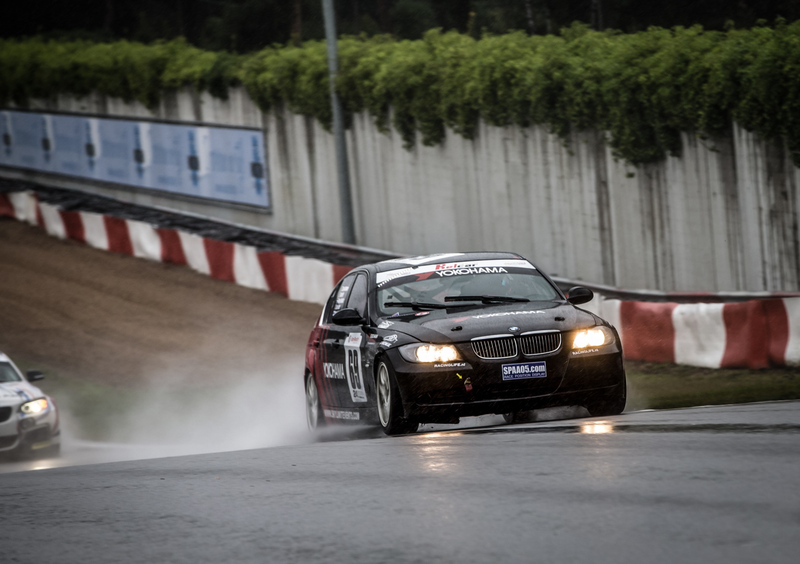 On a new circuit, at night, in the wet… I’m not so confident! So I’ve still got a lot to learn, but we’re sat in second place in class, ready for the weekend. Today (Friday) is a quiet day. So the car is getting some love and I’m off to meet Davy for a trackwalk. Right now I feel like a bull in a china shop, charging into the tight corners with no real method or markers.